Steve Rice (Olympia, United States) on 19 March 2019 in Landscape & Rural. This is what the refuge looks like at low tide. There are warnings to stay on the boardwalk, once you start walking there, due to the soft mud. Some water remains, in other parts of the refuge, but it's mainly fresh water. There are many things in nature whose purpose is not easy to understand. The tide is at least for me. Très bel endroit et très jolie photo dans sa composition. Low tide creates beautiful shapes and textures ! A like your compo with the pier ! Very beautiful image of this low tide, the bridge is very beautiful! Superb landscape! Looks like someone pulled the plug in the tub! Looks like a drastic event occurred. Beautiful view here..lovely landscape !!!!! I would not be tempted to walk there. It looks like a muddy mess. Excellents détail de la nature. A wonderful image. 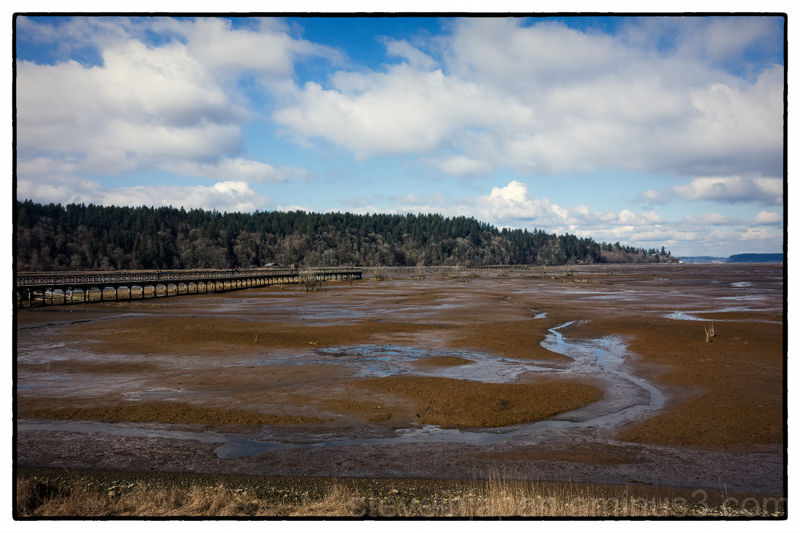 It is amazing how much land is revealed when the tide is out. I can imagine that it would be quite easy getting stuck in the mud. Wow, what an expanse. I am reminded of the bay of Fundy region in Nova Scotia.